Licensed under Creative Commons Attribution 3.0 (Unknown ). Gadolinium is a chemical element with symbol Gd and atomic number 64. Gadolinium is a silvery-white, malleable, and ductile rare earth metal. It is found in nature only in oxidized form, and even when separated, it usually has impurities of the other rare earths. Gadolinium was discovered in 1880 by Jean Charles de Marignac, who detected its oxide by using spectroscopy. It is named after the mineral gadolinite, which is one of the minerals in which gadolinium is found, itself named for the chemist Johan Gadolin. Pure gadolinium was first isolated by the chemist Paul Emile Lecoq de Boisbaudran in about 1886. Gadolinium possesses unusual metallurgical properties, to the extent that as little as 1.0 percent of gadolinium can significantly improve the workability and resistance to oxidation at high temperatures of iron, chromium, and related metals. Gadolinium as a metal or a salt absorbs neutrons, and it is, therefore, used sometimes for shielding in neutron radiography, and also in nuclear reactors. Like most of the rare earths, gadolinium forms trivalent ions with fluorescent properties, and salts of gadolinium(III) are used as phosphors in various applications. The kinds of gadolinium(III) ions occurring in water-soluble salts are toxic to mammals. However, chelated gadolinium(III) compounds are far less toxic because they carry gadolinium(III) through the kidneys, and out of the body, before the free ion can be released into the tissues. Because of its paramagnetic properties, solutions of chelated organic gadolinium complexes are used as intravenously administered gadolinium-based MRI contrast agents in medical magnetic resonance imaging. GAF is a company based in Parsippany, New Jersey, that has roots dating back to the late 19th century. The GAF acronym stands for General Aniline & Film. The company has historically been primarily focused on manufacturing of roofing materials for residential and commercial applications. At one time GAF was also active in manufacturing photographic film as well as cameras and projectors (both still and motion picture), and was the manufacturer of the View-Master, the famous line of 3D transparencies, viewers and projectors. Briefly in the 1970s, it was the official film of Disneyland and Walt Disney World, and at this time, actor Henry Fonda served as the company's spokesman in several television commercials including one that featured Jodie Foster in her first acting role. Jim Schnepper is the President of GAF, an operating subsidiary of Standard Industries. Gaggenau Hausgeräte (en: Gaggenau Home Appliances) is a German manufacturer of high-end home appliances. The company won at the 2008 IF Design Awards in every category in which it had nominations. Licensed under Creative Commons Attribution-Share Alike 2.5 (The original uploader was Jeff dean at English Wikipedia). On a vehicle, a gaiter or boot refers to a protective flexible sleeve covering a moving part, intended to keep the part clean. The Galactic Center, or Galactic Centre, is the rotational center of the Milky Way. It is 8,122 ± 31 parsecs (26,490 ± 100 ly) away from Earth in the direction of the constellations Sagittarius, Ophiuchus, and Scorpius where the Milky Way appears brightest. It coincides with the compact radio source Sagittarius A*. There are around 10 million stars within one parsec of the Galactic Center, dominated by red giants, with a significant population of massive supergiants and Wolf-Rayet stars from a star formation event around one million years ago, and one supermassive black hole of 4.100 ± 0.034 million solar masses at the Galactic Center, which powers the Sagittarius A* radio source. A galea was a Roman soldier's helmet. Some gladiators, myrmillones, also wore a bronze galea with a face mask and a decoration, often a fish on its crest. The exact form or design of the helmet varied significantly over time, between differing unit types, and also between individual examples - pre-industrial production was by hand – so it is not certain to what degree there was any standardization even under the Roman Empire. Originally, Roman helmets were influenced by the neighboring Etruscans, people who utilised the "Nasua" type helmets. The Greeks in the south also influenced Roman design in the early history of Rome. For instance, the ancestor of the Chalcidian helmet, the Attic helmet, was widely used by officers until the end of the empire. Lastly, the Gauls were the peoples who most impacted the design of the Roman helmet hence the popular "Imperial Gallic" type helmets. In addition to this, it is commonly thought that the Gauls also introduced chainmail to the Romans. The primary evidence is scattered archaeological finds, which are often damaged or incomplete. There are similarities of form and function between them. In materials science, galfenol is the general term for an alloy of iron and gallium. 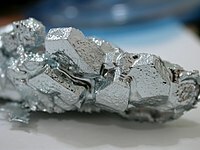 The name was first given to iron-gallium alloys by United States Navy researchers in 1998 when they discovered that adding gallium to iron could amplify iron's magnetostrictive effect up to tenfold. Galfenol is of interest to sonar researchers because magnetostrictor materials are used to detect sound, and amplifying the magnetostrictive effect could lead to better sensitivity of sonar detectors. Galfenol is also proposed for vibrational energy harvesting, actuators for precision machine tools, active anti-vibration systems, and anti-clogging devices for sifting screens and spray nozzles. Galfenol is machinable and can be produced in sheet and wire form. In 2009, scientists from Virginia Polytechnic Institute and State University, and National Institute of Standards and Technology (NIST) used neutron beams to determine the structure of galfenol. They determined that the addition of gallium changes the lattice structure of the iron atoms from regular cubic cells to one in which the faces of some of the cells become slightly rectangular. The elongated cells tend to clump together in the alloy, forming localized clumps within the material. These clumps have been described by Peter Gehring of the NIST Center for Neutron Research as "something like raisins within a cake". Galinstan is a commercial liquid metal alloy whose composition is taken from a family of eutectic alloys mainly consisting of gallium, indium, and tin. Such eutectic alloys are liquids at room temperature, typically melting at −19 °C (−2 °F). Due to the low toxicity and low reactivity of its component metals, Galinstan finds use as a replacement for many applications that previously employed the toxic liquid mercury or the reactive NaK (sodium–potassium alloy). An example of a typical eutectic composition is 68 wt% Ga, 22 wt% In and 10 wt% Sn, though it varies between 62 wt% and 95 wt% Ga, 5 wt% and 22 wt% In, 0 wt% and 16 wt% Sn, while keeping eutectic ability. The marketing name is a portmanteau of gallium, indium, and stannum (Latin for "tin"). Galinstan is a registered trademark of the German company Geratherm Medical AG. The exact composition of Galinstan is not publicly known. Licensed under Creative Commons Attribution-Share Alike 3.0 (en:user:foobar). Gallium is a chemical element with symbol Ga and atomic number 31. It is in group 13 of the periodic table, and thus has similarities to the other metals of the group, aluminium, indium, and thallium. Gallium does not occur as a free element in nature, but as gallium(III) compounds in trace amounts in zinc ores and in bauxite. Elemental gallium is a soft, silvery blue metal at standard temperature and pressure, a brittle solid at low temperatures, and a liquid at temperatures greater than 29.76 °C (85.57 °F) (slightly above room temperature). The melting point of gallium is used as a temperature reference point. The alloy galinstan (68.5% gallium, 21.5% indium, and 10% tin) has an even lower melting point of −19 °C (−2 °F), well below the freezing point of water. Since its discovery in 1875, gallium has been used to make alloys with low melting points. It is also used in semiconductors as a dopant in semiconductor substrates. Gallium is predominantly used in electronics. Gallium arsenide, the primary chemical compound of gallium in electronics, is used in microwave circuits, high-speed switching circuits, and infrared circuits. Semiconductive gallium nitride and indium gallium nitride produce blue and violet light-emitting diodes (LEDs) and diode lasers. Gallium is also used in the production of artificial gadolinium gallium garnet for jewelry. Gallium has no known natural role in biology. Gallium(III) behaves in a similar manner to ferric salts in biological systems, and has been used in some medical applications, including pharmaceuticals and radiopharmaceuticals. Gallium is used in thermometers as a non-toxic and environmentally friendly alternative to mercury and can withstand higher temperatures than mercury.